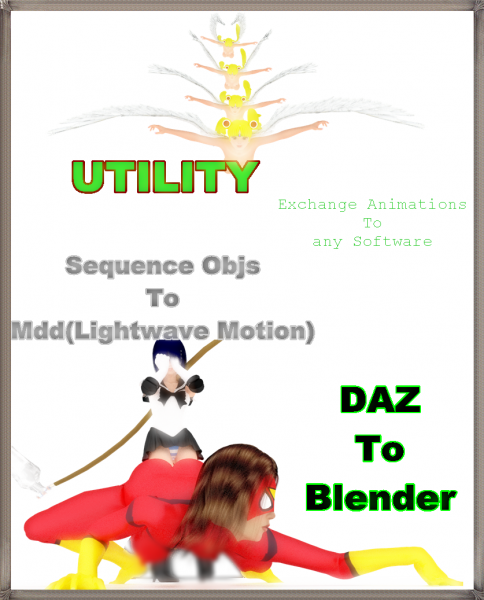 Motion in Blender figures of DAZ. FPS = 30 Frames per seconds. mdd (mesh cache) allow easily sharing mesh deformations animated(Morphs, Cloth Dynamic,motions figures) to other applications Blender, Modo, Houdini, Maya, Autodesk,MarvelousDesigner,C4D. This can useful for caching Dynamics Softbodies.Your animations for other applications for rendering. Fix bugs last File objs. Recommend for programs Line Command "FileMenuTools". Renders in Blender: Time Render 5 - 45 Segs. hu huhu (1 year ago) Inappropriate? I like it very much!! Thanks a lot! I export the meshes from Realflow in .obj seq for use in Carrara but it's very heavy to load at each image.I dream to have a converter like that and you've done it.